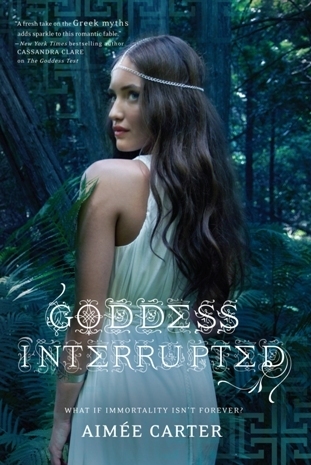 After reading The Goddess Test I was highly anticipating its sequel "Goddess Interrupted" but sadly, I was disappointed. The story starts after Kate gets back from her vacation and while her, and even I, expected to be greeted by Henry, we get sucked right into the problem. While this might be good, we never got the reunion I've been dying for. Even after they did meet (a third into the story) it was very distant and emotionless. This drove Kate crazy and in turn ME crazy. Kate was SO whiny in this book. All she thought about was "Why doesn't Henry love me as much as he loved Persephone?". Her constant feeling of inferiority toward Persephone and nagging to Henry wanted me to slap some sense into her. Yes, some of her behavior is explanatory because of henry's detachment, but at some times she acted like a 5 year old that wanted her mother's constant and devoted attention. As for the conflict and plot, it felt a bit rushed. While it was interesting I just felt that if we were given more time to settle down in the underworld before all this was sprung at us, I would have enjoyed it more. Of course in the end Kate and Henry's conflict is resolved but ALL OF THAT would have been avoided if Henry just TALKED. He stayed quiet, and caused Kate to misunderstand and the tiny snowball turned into a gigantic 10 foot snowball. I just wished there was MORE to the story, because I felt something missing throughout the whole book and in the end I did enjoy the complications that occurred, and the appearance of Persephone definitely brought tension and drama into the plot. Hopefully the third book would pick up from The Goddess Test's epicness and for the trilogy to end in a great note. Ah I'm SO glad I'm not the only one who wanted to slap Kate more than a few times! Without all the whining and Henry being a douche I would have enjoyed this one a whole lot more! I agree with you and your review! I felt very dissapointed as well with a book that I has hoping to love. I could not get past Kate's whining! I'm reading this book now and I totally agree with you. It's making me tired of waiting about Henry and Kate relationship to develop. I hope the 3rd book much much better than this.